Classical music enthusiasts from across the world probably recognize her as one of the best guitarists of our time. But more than that, this 43 years old Greek-born artist – who now lives in Belgium – is also known as the Founder and Artistic Director of the infamous Volterra Guitar Project. She is Antigoni Goni. Her encounter with the guitar began in her early childhood, and it was perhaps some kind of a destiny. “For as long as I can remember, the guitar was present in my life: resting in a corner, ready to be picked up and come to life in the hands of my father and their friends accompanying the songs of Mikis Theodorakis and the other composers that marked the 70s in Greece,” she described. At the age of 17, after several months split up with the guitar and went ‘literally mad’ because of it, Goni convinced herself that music was her life. By the start of the 1980, she had her first formal trainings at the National Conservatory of Athens (GREECE) with Evangelos Assimakopoulos. In 1991, she completed her diploma at the Royal Academy of music in London (UK) under the guidance of John Mills and Julian Bream (in master class setting), then earned her Master degree at The Juilliard School in NYC (USA) with Sharon Isbin by the year 1994. Antigoni Goni is a recipient of many prestigious awards and prizes, and some of them are: the Laureate and Special Prize in the Havana International Guitar Competition for the Best interpretation of Latin American Music (for the interpretation of “Sueño en la floresta” by Augustin Barrios Mangore) in 1988; the 1st Prize in Julian Bream Prize, London, UK, in 1991; First Prize at the Young Artists International, NYC, in 1992; 1st Prize in the Guitar Foundation of America Competition in 1995, and also the Associate of the Royal Academy of Music in London (ARAM) in 1996. Throughout her musical career, Antigoni Goni had performed in dozens of major events. Some of the most memorable ones are: her performance at the Odeon of Herodes Atticus in Acropolis, Athens, GREECE; Debuts at the Carnegie Hall, NYC, USA, the Wigmore Hall, London, UK, also at the Duke’s Hall, Royal Academy of London, UK; the Bolshoi Theater, Moscow, Russia; the Royal Brussels Conservatory, Belgium; her first Japan concert Tour, and many more. She has also recorded—both solo and collaborative—works from some of the world’s greatest composers such as Augustin Barrios, Leo Brouwer, and John Duarte; the recordings are released on NAXOS, KOCH International Classics and Willow Shades Classics. Being a successful guitarist with such resume is one thing, but her passion in music education for the young—both academic and non-academic—is another thing. She has been deeply involved in music education for nearly 20 years, and holding many positions in various institutions. From Teaching Assistant in Aspen Music Festival (1993), Founder and Head of the guitar department at the Juilliard Pre-College (1995-2004), Guitar Professor at Koninklijk Conservatorium van Brussels, Belgium Division (2004 to present), to the Founder and Artistic Director of Volterra Project Summer Guitar Institute (2006 to Present). With all that, Antigoni Goni seems to fit what most envision about the true artist. Timothy Walker, one of the guitar greats and a retired guitar teacher at the Royal Academy of Music, in the interview with Listen to the World said something like this:”Professionals are those who are amateur at hearts.” In this case, we hope Antigoni Goni will stay amateur at her heart. Thanks to our UK’s representative, Ginastera ‘Boo-Boo’ Sianturi, for making this interview possible. The interview gives the feeling as if she is taking us with her on the ride to her journey, mind and heart. What a ride! LTTW: You initiated the Volterra Guitar Project in 2006, and you have directed the program so that it has received attention from guitarists around the world. What is the concept and the mission behind the Project? What the Project has achieved so far, and what is yet to be reached? 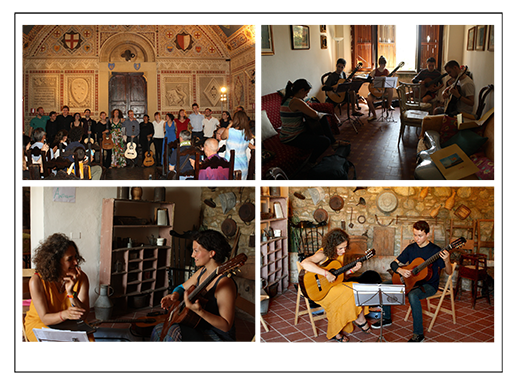 AG: When I conceived The Volterra Project, Summer Guitar Institute my intention was not to create another traditional summer school, but to put together an experiment in international classical guitar teaching. As a matter of fact, the idea at the base of the Volterra Project matured very slowly, since my students years, out of the consideration that training in music skills is not sufficient by itself to equip young musicians with the necessary tools to be able to tackle the “nasty and ruthless outer world”. Artistic excellence is essential, but by itself is not sufficient. A young guitarist, besides the long hours of rehearsal on the instrument, needs a basic understanding of other fundamental components of her life as a musician, such as how to take care of her body in synergy with the instrument, and how to deal with the managerial aspects of the career. Students need a school able to form not only highly skilled guitarists, but also mature musicians, able to face by themselves the needs of an international career. Worldwide, of course there are many summer schools of excellence. However, none among them integrates the dimension of guitar teaching with other elements, nowadays essential to the artistic and professional growth of a young guitarist. In my professional career as a teacher and international performer, I always considered this extremely concerning: too often wonderfully skilled and talented young guitarists are left alone and unprepared to compete in the professional arena. This is why today the Volterra Project is an innovative experiment in classical guitar training offering a 360- degree formative course with highest level guitar master classes, music physiology training, and arts business management seminars taught by experienced, internationally-renowned professionals. Its mission is to help young guitarists develop well-rounded and non-competitive approaches to performing, to foster a new generation of accomplished young guitarists who are prepared for the multiple aspects of performing careers, including artistic achievement, physical health, and sound business management, and to bring the guitar outside traditional performance venues into places of community access. Also, The Volterra Project was conceived as innovative not only in its didactic offerings, but also in its form and context. The ten-day workshop will be held in a beautiful agriturismo, a rustic complex in Volterra, Tuscany (Italy), where students and teachers will live together in a relaxed, non-competitive environment, inspiring mutual exchange and personal growth The Volterra Project replaces the competitive culture of the conservatory with a more nurturing environment, conducive to a real exchange of knowledge and experience. In the past six editions, The Volterra Project generated great enthusiasm and attracted participants from the entire world, including Belgium, Canada, France, Germany, Greece, Iran, Italy, Lithuania, The Netherlands, Russia, Sri Lanka, Syria, South Africa, Switzerland, Hungary, and over a dozen of U.S. States. Finally, “What yet has to be reached”, you ask? The idea of “project” in the Volterra Project summarizes the concept: at the very base of the workshop is an effort to find answers to an ongoing challenge, Every edition of the “Volterra project” tackles different nuances of all the three dimensions which constitute the pillars of our educational structure: guitar masterclasses, business seminars, and music physiology. You have been involved in music education for quite some time; how do you evaluate the on-going music education, particularly Classical music, so far? What issues that need to be addressed in the future? 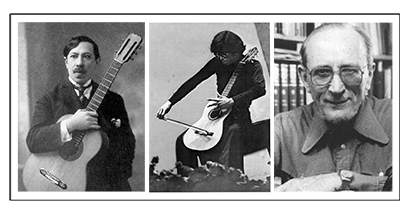 In essence, there are many similarities between the previous generation of guitar students and the present one. Like when I was a student (and even before that, I have been told), young students today are going for a super competitive, narcissist, and arrogant technique display. Musicality and artistry always came at their (usually much slower) pace. However, I am under the impression that there is at least one difference: in the last years, the degree of sophistication and research for a cultural improvement has seriously weakened. The effort, the strife to achieve superior levels of artistic sophistication has been substituted by an increased tension to obtaining short term result (in a way, a sort of instant gratification). My idea, which I infused in the Volterra project, is that instead we need artists with a more rounded completeness; we need a music formation nurturing artistic, spiritual, and emotional growth in addition to the technical skills’ one, resulting into the development of a personality that comes closer to the Renaissance man model. Otherwise we will witness the multiplication of monodimensional jongleurs, while true artists will become specie of the past. There has been a growing belief and practice that musician is merely a profession to make a living in which music is treated more as just a “vehicle” to generate income; is this the way a musician should take today and in the future? This is a concept that I never understood and never agreed with. Actually, I am not even sure that the issue could be generalized. However, for those who share this way of thinking I could reply that If you want to make money and if money is your goal then to be a Musician may not be the good choice. John Wunsch, a former guitar teacher at the Interlochen Arts Academy, stated that it is unfair to measure the success of an artist or musician by the level of fame and fortune that she or he gains. The majority of the workforce in other fields ranging from architecture, banking, law and so on is neither famous nor rich, just like in the music sector, and yet they are regarded as “successful” by the society. Do you agree with his statement? How should we cope with this matter? And who should be in the forefront to tackle this issue? Musicians, educational institutions, media? I think that success is a very elusive and extremely dangerous issue to tackle all together. Success is ephemeral, extremely subjective and dependant on so many parameters and variables that at the end cannot be really measured nor defined. Unfortunately, our society is a society that loves quantity of production, standardization, objective measurability, and big numbers. Quality, soul, individual happiness, personal enrichment, social contribution, are words and notions that today seem to mean very little. If there is anything similar to personal success, I think it should be measured only in front of the mirror, not listening to the market popularity lists, or counting the number of lines on a bio. Of course educational institutions and media are in the forefront in defining the cultural values, but their evolution and change can only be tackled in its complexity. People say that we now live in a digital world, and yet Classical music (in this case is Classical guitar) is more of an acoustic world; should this “contrast” be a problem or compliment? I don’t believe in the necessity of absolute polarizations. Black and white, man and woman, left and right, bad and good… of course, the archetypes are there, but real life is another thing. The contrast you speak of is neither a problem, nor a compliment. The existence of these two worlds, so different, sometime counterpoised, is a one of the elements that define their identity. Digitalization, combined with the idea that anyone has the right to do any art work (and everyone is basically an artist), has made individuals with inadequate training and knowledge can produce a “likable” music. Does this make the titleship of musician no longer relevant and important? “Titleships” and labels. Here’s another thing I do not believe to or, if you prefer, I totally distrust. Being an artist is not a “titleship” you acquire and is not something that anyone can take away from you. A real artist is not threatened by the existence of millions of other so-called “artists”. I don’t feel that the effortless easiness with which we can easily produce “stuff” today threatens in any way real art. On the contrary, this helps good, genuine, inspired, magnificent artistic manifestations. It would be like saying that the mere existence of McDonald’s would threat a five star Michelin guide restaurant. These are two entirely different things. The question would, instead be another one: why masses of teenagers are opting to consume cheap food and cheap music instead of turning to quality one. The answer, I am afraid, would pertain to a much larger domain that the one set by this interview. You have dedicated your life to Classical music; do you appreciate music of other genre or nations? Any of these music carry any influence on you and/or your music? 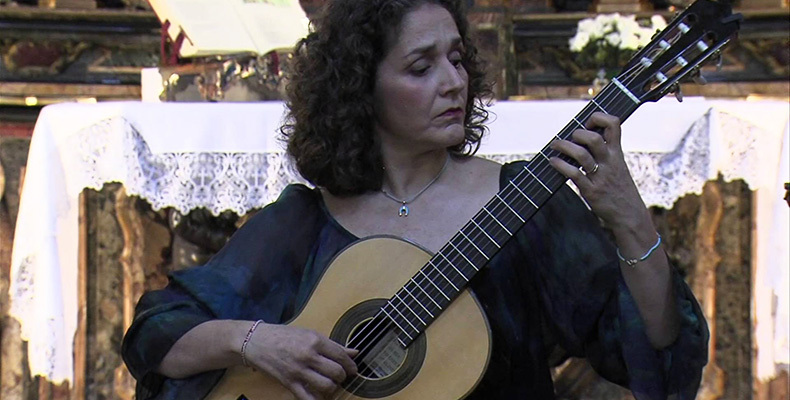 I entered the classical guitar world through the popular music of my native Greece. I found my place in the classical guitar exactly because it is a world that encompasses the music of all nations and has drawn inspiration from all other genres. For me classical guitar is the most alive, fresh and contemporary of all the classical instruments exactly because of that. I don’t define myself as a classical guitarist but more as an artist and a musician. What drew you to Classical music? And why the guitar? I was introduced to classical music by my grandfather who every Sunday painted in his studio blasting Mozart and Beethoven over his turntable. However I was drawn to classical music by the guitar itself, her beautiful sound, her humanity, her ability for harmony and bel canto, her subtle colors and passionate character. Yes, after all It was guitar that lead me to classical music. You are regarded as one of the best Classical guitarists in the world; what does it take to be a true musician? C’mon! It would be like asking, “What does it take to be a true human being?” I think the ingredients are the same: self-awareness, lots of work, constant presence, sincerity, balance between intellect and emotions, constant re birth and re definition, curiosity, vulnerability, respect (self respect, respect for the things you do, for others…). Many consider that 20th century music up to the late 70’s, particularly Classical and its “branches”, is more explorative compare to the period afterward; how do you comment on such comparison? Art is a mirror of life. Compared to the present, the 20th century, up to the late 70s, was a very different time. It is only natural that this would be reflected on the music and in the arts in general. At the time, the serious music on one side and pop music on the other were inter-connected, they seemed to stimulate each other. Rock music then came up with the “progressive” and “psychedelic” led by ,among others, Yes, King Crimson, and Tangerine Dream, Pink Floyd respectively, while musicians from Serious music like John Williams entered the Pop segment with his group called Sky, and Stomu Yamash’ta with GO. Today, we hardly see this kind of inter-action, why, do you think? This is a rare interaction indeed because it requires both technical skill, vision, mind openness, courage, curiosity, intuition, genius …. Am I repeating myself? Yes: it requires true artists to do this. And true artists can flourish and find stimuli and creative power only in very particular conditions and moments. How do you foresee Classical music, let’s say in the next 20 years? I can hardly foresee my day tomorrow “LAUGHS”, how could I foresee the next 20 years?? I will only say that I trust life and the driving creative force in the human race. I trust we will see magnificent things and my only wish is to be still part of it. My most sincere congratulations for such inspiring and passionate work. Thank you very much for your kind acceptance upon this interview, and more importantly, thank you for your contribution to music. We’re sure that this interview will inspire many. Today’s guitarists are brainless, soulless automatons. Blaming today’s students is not correct, since the teachers preaching about musicality, often rattle down music in the same mindless manner as their students. Only that their students have better technical capabilities. This is nothing new. Look at guitarist Narciso Yepes. His interpretations of Bach, Sor etc. show that a strict, technical and cold manner of playing has been around for a very long time. valoroasa, mai ales ca am mai gasit aici si despre ora, ora exacta, lucruri interesante si folositoare.